Counting to 21 is fun when kids count the trucks and vans. Look for and circle the car in each set going the wrong way! Write the numbers on the lines and color. 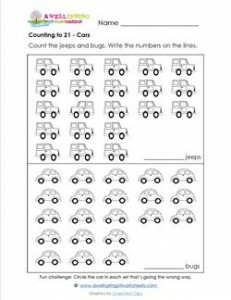 Please go to this page to see all the counting numbers 21-30 worksheets in this set.